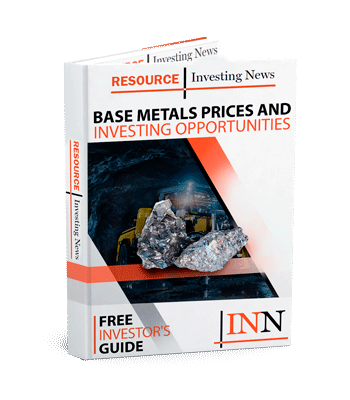 In this week’s round-up, INN takes a look at what’s making news in the base metals sector with a price update, our top three stories and a look at news headlines around the world. This week, base metals have been uniformly on the way down as the major economies of the world threw around sanctions and tariffs. Copper ended last week above US$7,000 a tonne, but by Monday (June18) had fallen to US$6,985 — a trend that only continued as the week wore on, loosing 2.64 percent of its value and eventually reaching a low of US$6,800. The red metal is now sitting roughly where it started out in June. Lead was also down, but not quite as dramatically as its base metal cousin copper. Lead lost 1.16 percent of its value over the week, starting out at US$2,411 a tonne and sliding to US$2,383. Meanwhile, zinc shared the fortunes of copper, falling from US$3,107.5 a tonne to US$3,021— a loss of 2.78 percent. Our three top base metals news stories over the last week range from a bidding war to an Amazonian adventure and an invasion from the land down under. In Western Australia, mining giants have been playing tug of war with Atlas Iron (ASX:AGO), a small iron ore company with various assets in the Pilbara and most attractively (apparently) a role in a port redevelopment that has buyers circling. Mineral Resources (ASX:MIN) started the festivities with plans to merge with Atlas —an aspiration that was quickly quashed by Fortescue Metals (ASX:FMG), which swooped in to buy almost 20 percent of Atlas and blocked the move. Not to be left out of the party, mining magnate Gina Rinehart made a similar move, snapping up a similar share before truly throwing down the gauntlet with a AU$390 million takeover bid for Atlas. As the headline suggests, it’s now a two-horse race, but the drama continues. Anglo American (LSE:AAL) put on its backpack and headed out into the Amazon rainforest this week, with the mining giant securing itself 1.9 million hectares of land to explore. According to reports, the company plans to explore for copper in Mato Grosso and Para states, no doubt hoping to tap into an increasingly thirsty market for the red metal. The company is yet to begin studies on the project though, so watch this space. BHP (ASX:BHP) spin-off company South32 (ASX:S32) has charged into the North American market in a departure from its regular MO, after buying the remainder of Canadian miner Arizona Mining (TSX:AZ) it didn’t already own for a cool C$1.8 billion. For that, South32 will have the Hermosa zinc-lead project to add to its collection. Hermosa includes the Taylor deposit, which according to Arizona Mining, has a measured mineral resource of 15.2 million tonnes grading 4 percent zinc and 4 percent lead, as well as an indicated mineral resource of 85.8 million tonnes grading 4.2 percent zinc and 4.3 percent lead. South32 paid a healthy premium for the Canadian miner’s assets, with shares bought for C$6.20 each — a 50-percent premium on the previous week’s closing value. In other base metals news around the world, nobody can escape the reality that the US and China are having a big impact on prices with what’s looking like a trade war. Europe wants to play too. Base metals have for the most part aped each other and taken a dive over the past week in response. According to a report from the International Copper Study Group (ICSG) released this week, worldwide copper production was up 7.1 percent in the first quarter of 2018 — mostly thanks to Chile, Indonesia and the Democratic Republic of Congo. Production also benefited from a break from any supply disruptions. In Australia, iron miners are pulling out the checkbooks to keep production humming, with Rio Tinto (ASX:RIO) hinting it would be spending US$2.2 billion on replacement mines, contributing to more than US$6 billion announced by miners to be spent in the Pilbara in coming years on similar projects. Heron Resources (ASX:HRR) is also keeping up the flow of happy news, announcing this week it had locked in a power supply contract for ongoing work at its Woodlawn zinc-copper mine in New South Wales. And while it happened last week, analysts are still poring over Glencore (LSE:GLEN) and its decision to spend US$3 billion to make Israeli billionaire Dan Gertler go away. Time will tell if efforts by the company to sidestep US sanctions by paying royalties to its former partner in Euros will work out. The Democratic Republic of Congo’s Gecamines clearly likes the deal it’s made with Glencore, boasting that the state will have billions rained down upon it thanks to negotiations between it and the formerly beleaguered miner.